Walsall have signed midfielder Josh Wakefield from AFC Bournemouth on a no-cost loan until the end of the season, with a view to a permanent deal. Wakefield has made four substitute appearances for the Cherries, but has not featured since September 2012. 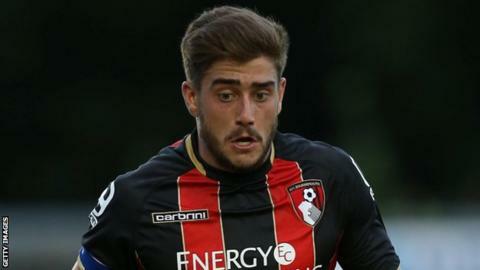 The 22-year-old has since had loan spells with Welling, Torquay United, Bristol Rovers and Yeovil Town. "He's technically good with an excellent attitude," said Saddlers head coach Sean O'Driscoll. "Bournemouth have been really good in allowing Josh to come here initially for a month and at no cost, with a view to making the move permanent. "With so many players out of contract this summer, as well as focusing on our current task in hand, we also have to have one eye on the future, to bring players in that fit into this club's philosophy and financial structure." Meanwhile, Walsall youngsters Jordan Sangha, 18, and Qamaruddin Maziar Kouhyar, also 18, have signed their first professional contracts with the club. Both have penned a one-year deal with a further year's option. Sangha has come through the club's youth ranks, having played at every youth age level, from Under-9s through to Under-16s, while Kouhyar joined the Saddlers in April 2013 at the age of 15, following his release from Coventry City.